There’s just something about getting outside and being one with nature. The sounds. The smells. The fresh air. Not to mention enjoying the great outdoors with the entire family. Insert sounds of a vinyl record screeching ... wait, what? As pleasant as that all sounds, how is it even possible with children who have the attention spans of 2 year olds? Well, as the saying goes, where there is a will, there is a way. And Rob Bignell of Menomonie brings us both. Rob, who has authored 20 hiking guidebooks – many of them focused on Wisconsin and Minnesota – answered our questions about connecting children to nature and getting kids amped about hiking. Here he offers general tips and guidelines for preparing for a day hike. Are there good rules of thumb to know how old kids should be before they can tackle a hike, or is it a matter of not knowing until you’ve tried it? Rob Bignell: Your child can go hiking with you as an infant; the downside is you’ll have to carry the baby in a Snugly, which can be uncomfortable as it throws off your center of balance. I advise waiting until the child is old enough to hold his head up – which usually is between four to six months – and then you can place him in a child carrier. A child usually is old enough to walk at about four years, but you’ll need to change your perception of what a hike is. Preschoolers wander rather than hike in a straight line to the destination, they have shorter legs than adults so go “slower,” and they simply won’t be able to walk as far as an adult could. This all improves through the elementary school years. The big problem with older teens is that they usually can go faster and farther than an adult, so now you’re the one lagging! What are some of your favorite hiking trails in the Chippewa Valley? • Big Falls Trail at Big Falls County Park. This is a trail with a big payoff. After a short walk through a pine grove, you can amble over 1.85 billion-year-old rocks alongside the Eau Claire River with Big Falls in the background. • Interior Loop at Beaver Creek Reserve. The trail’s ecosystems constantly change – from walking alongside a creek then a river then through an oak savanna, so kids are never bored. They’ll also love the turtle ponds near the trail’s end. • Red Cedar State Trail northern section. In Menomonie, the trail’s northernmost 1.5 miles or so head over a railroad bridge, past a rifle-filled river, alongside a weeping wall, all while bald eagles and sandhill cranes dive into the water for fish. 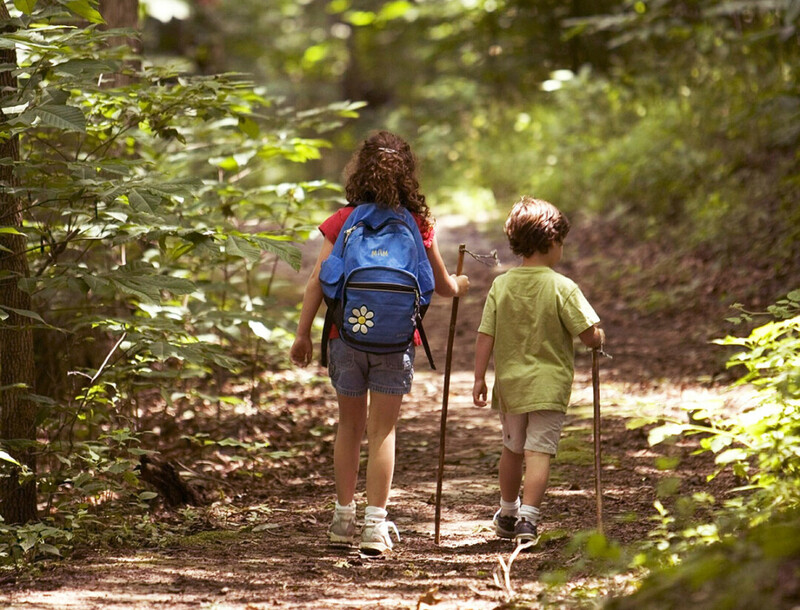 What are some must-pack items to have when you go hiking with kids to ensure you have a fun (and safe) time? • Layered clothing. Though summer is associated with warmth and sun, there can be cold days, and a blue sky morning can quickly turn into a rainy afternoon. While the layers need not be as thick as what you’d wear in winter, you still want to bring a sweatshirt and windbreaker (at least tuck it in the backpack), as well as don a brimmed hat and sunglasses. You always can take off layers but you can’t put them on if they’re at home. • Water. Newbie hikers tend to underestimate the amount of water they’ll need; experienced but lazy hikers tend to think they can get by with less to rationalize not carrying the extra weight. Adults need at least a quart for every two hours hiking. Children need to drink about a quart every two hours of walking and more if the weather is hot or dry. • Map and compass. The greenery of a trail can limit your view, so you’ll need navigational tools. Using GPS is fine on the trail ... until it breaks after being dropped or the batteries die. Always bring a paper topo map and a compass; routinely refer to them to ensure you don’t get lost. • First-aid kit. The odds of you breaking an arm, cutting a hand, or twisting an ankle are slim on a hike. But hedge your bets by bringing a first-aid kit (and know how to use it) and not doing silly stuff like horsing around on boulders or crossing rapidly moving water for a short cut. • Nontoxic bug repellent. Mosquitoes and ticks will be out in summer. Avoid them by using a nontoxic bug repellent, like lemon and eucalyptus, and stay on the trail rather than track through the bush and wet areas. What are some of your favorite trail games for kids? • I Spy. Name things you see on the trail and have kids point them out to you. List objects that aren’t obvious, such as spider webs, dew drops, a crawling bug, or tossing pebbles. Materials: None needed. Ages 3 and up. • Picture Hunt. If you have older elementary school children and each has a digital camera, play a game in which each must snap pictures of as many plants and animals as possible and then correctly identify them. The game assumes that as the referee and judge you know what the plants and animals are. If the park you visit offers a brochure listing common flora and fauna in the area, that list could serve as a guide – or your children might snap pictures of those listed plants and animals in a sort of scavenger hunt. Materials: Digital cameras, brochure. Ages 7 and up. • Orienteering. Have kids look at a topo map and identify the real world features: a ridgeline, a draw, a distant mountain peak. With a compass and map, have them track your course on the trail, telling you when you’ve reached specific points that you’ve marked on the map. To help kids understand how many steps they need to take to travel a specific distance, they may want to wear a small pedometer. Materials: Topo map and compass brought as navigational tools. Ages 10 and up. Rob Bignell has written 20 hiking guides, most recently about trails in Wisconsin’s Washburn County (published in April) and Minnesota’s Split Rock Lighthouse State Park (which will be published in late May). His books are available in paperback and Kindle form from Amazon.com.